One thing front and center at EAA AirVenture Oshkosh is innovation. Nowhere was that more evident that at 9:30 Tuesday morning when Sonex Aircraft introduced its proof of concept electric motor in a Waiex airframe. Sonex Aircraft, LLC and AeroConversions Products recently unveiled a new research and development initiative to explore viable alternative energies for powering the sport aircraft of tomorrow. In making the announcement, Sonex President John Monnett said, "E-flight is a push to explore viable alternative energies for powering sport aircraft and improve the efficiency and performance of current products and technologies to keep aviation affordable and recreational aviation available to future generations of pilots." 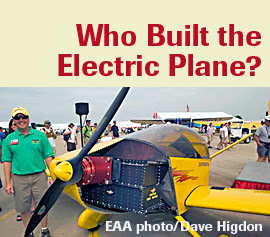 Yes, the gap is wide for those wanting to market a FAA-certified electric plane. But these two companies are gutsy enough to at least explore the possibility. Kudos to them. If I were at the EAA show today, I would make sure to visit the Sonex or AeroConversions booths, find the principals and shake their hands, telling them thank you for having an open mind regarding the future of our planet, in an age where many still perceive the pursuit of green technologies to be a bad business model. Or, maybe instead of the usual and traditional GA greeting, I'd just give 'em a "Green skies to ya!"